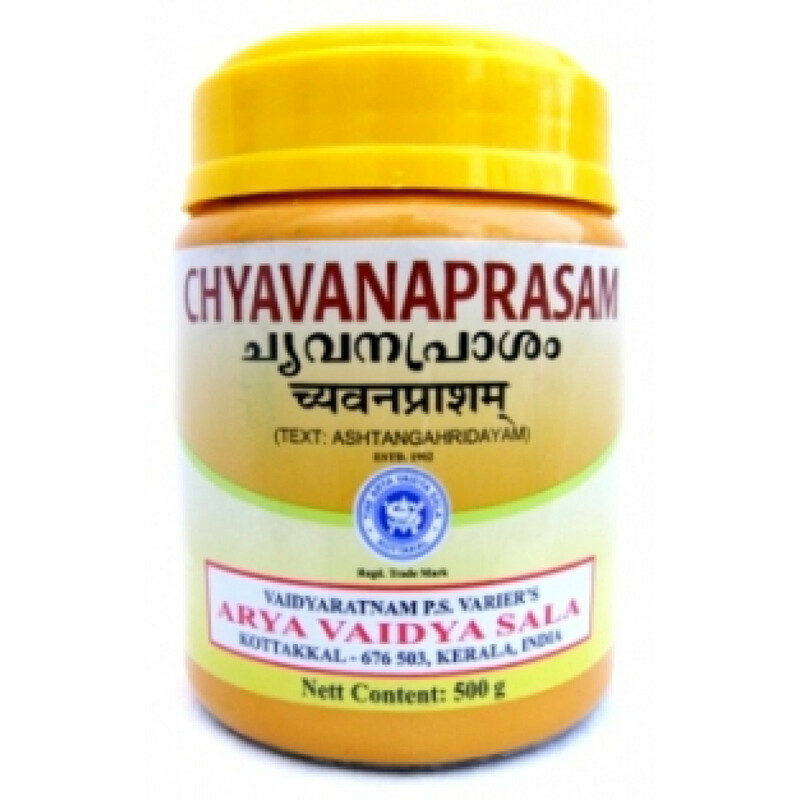 Chyavanaprasam (Chyawanprash) is one of the best immunomodulators in Ayurveda. It is a rejuvenating tonic, rich in vitamins, minerals and microelements with a very wide range of applications. Chyavanaprasam is effective for the treatment of acute and chronic diseases of the respiratory system, improves digestion, cleanses the intestines and blood of toxins, improves skin condition. Also Chyavanaprasam has a tonic effect on the heart, eyesight, the reproductive system, has a diuretic action. In addition, this product improves the nervous system, indicated for insomnia, poor concentration and memory. Chyavanaprasam is the most famous product of Ayurveda, known for over three thousand years. The recipe was first recorded by sage Charaka in his Charaka Samhita around the IV century BC. This medicine is a sweet-spicy soft jam of dark brown color. The basis of it is Amla. - source of vitamins and minerals. Content: Dashamula, Bala, Musta, Jeevaka, Rishabaka, Utpala, Pippali, Sringi, Meda, Tamalaki, Truti, Jeevanti, Jongaka, Draksha, Pushkara, Shati, Punarnava, Kakoli, Kshirakakoli, Kakanasa, Amrita, Abhaya, Vidari, Vrishamula each 89 mg processed with Dhatriphala 3.048 gm, Til Taila 0.762 ml, 0.762 ml Ghrita, Matsyandika 4.444 gm, Tukakshiri 356 mg, Pippali 178 mg, Chaturjata each 22 mg, Madhu 1.143 ml. Adults – 1 teaspoonful twice a day before meals. Children - 1/2 teaspoonful 1 to 2 times daily before meals. Acute respiratory infections the dose may be increased. Chyavanaprasam can sometimes cause an increase of acidity and heartburn. In such a situation it should be taken with small volume of warm milk or after meal. Contraindications: in case of diabetes to be taken with caution as Chyavanaprasam contains a lot of sugar, acute and chronic nephritis and pyelonephritis, gastritis. Pregnancy and breast-feeding: can be taken in small doses, or as directed by your doctor. Note: usually Chyavanaprasam Arya Vaidya Sala has inflated protective foil. It's a feature of technological process of packing. Arya Vaidya Sala is one of the best manufacturers of Ayurvedic medicines in the south of India. The technology of manufacturing and the composition of their Chyavanaprasam exactly correspond to the ancient Vedic texts. Original name: Chyavanaprasam Arya Vaidya Sala. In our store You can buy authentic Chyavanaprasam Arya Vaidya Shala at the best price!